Dixon Place presents a new comedy. 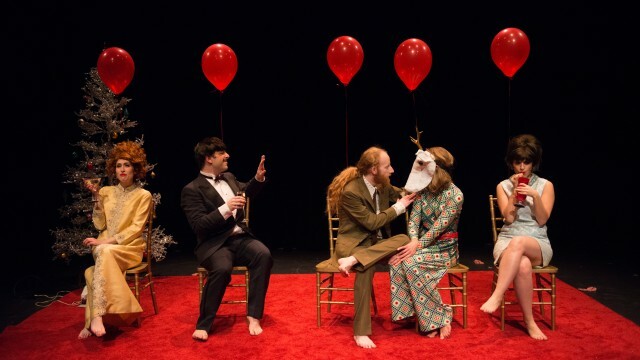 Dixon Place, a theatre venue devoted to new work, is currently hosting The White Stag Quadrilogy. Written by Christopher Ford and Dakota Rose and performed by the theatre group “On the Rocks,” the play is a sequel to Wolfert which was presented last year also at Dixon Place. A hurdle to overcome in filming the production is the fact that Jerry is under house arrest for a variety of offenses. While challenging, this restriction doesn't prevent him from trying to complete the film with his ex-wife (played by Rebeca Miller), her siblings (Michelle Uranowitz and Derek Smith) and a stripper (Jaime Wright). Yes, the elements are all there for madcap comedy. Jerry (as colorfully played by Butler) comes across as representative of certain character types whose appreciation of themselves gleefully exceeds their actual abilities. They are constantly re-inventing themselves to cover up failure, and have just enough charisma (and perhaps semi-competence) to inspire a group of improbable followers. In his relentless self-absorbed zaniness, Jerry also appears as something of a cross between Ed Wood (of Plan 9 from Outer Space fame) and Kramer from Seinfeld. Music is central to this production and the play employs an eclectic soundtrack – everything from Ravel to the Mamas and the Papas. There are also a number of self-celebratory dance sequences in the production which seem to gently mock the triumphant atmosphere of such iconic '80's dance films as Flashdance and Footloose. The show is directed by Dakota Rose, one of the writers. All in all the production has the comic atmosphere of an extended Saturday Night Live sketch, and some of the characters portrayed are a successful celebration of those whose “artistic” reach will always exceed their grasp. I guess there is something to be said for trying, particularly if there are some laughs along the way. The final two performances of The White Stag Quadrilogy are this Friday, February 26 at 7:30 pm and Saturday, February 27 at 7:30 pm at Dixon Place located at 161A Chrystie St. on Manhattan's Lower East Side.